JCMASTER Bath Sponges make your skin smooth and delicate, bring you a new bath experience News: Package is upgraded, changing from original paper box to vacuum package. It\'s normal that the loofah is tight, after several use, it will become soft. Please kindly soak it in hot water and hang to dry before use. :) DO YOU WANT TO HAVE HEALTHY, SMOOTH, RADIANT SKIN? JCMASTER shower sponge pouf are made of net material, it creates a thick rich lather ✓ Bath sponges size and hardness are suitable for children, which may be too hard for babies, but most customers can accept ✓ JCMASTER shower sponge pouf are made of net material, it creates a thick rich lather ✓ Gently clean and exfoliate your skin thoroughly, remove skin dead cells ✓ This net shower mesh pouf is soft enough to be used on sensitive skin ✓ Body bath scrubber are available with multiple colors ✓ The bath sponge a layer of lack mesh which make the mesh pouf looks much more elegant ✓ JCMASTER shower loofah sponge pouf equipped with elegant package, it is a perfect present to your family and friends at any time Fresh, exciting shower sponges. JCMASTER Bath Sponges make your skin smooth and delicate, bring you a new bath experience News: Package is upgraded, changing from original paper box to vacuum package. 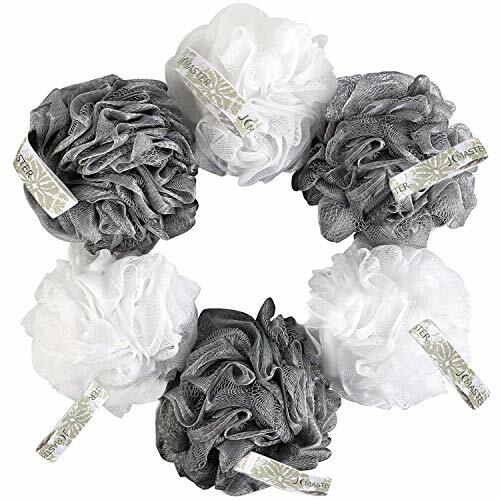 It\'s normal that the loofah is tight, after several use, it will become soft. Please kindly soak it in hot water and hang to dry before use. :) DO YOU WANT TO HAVE HEALTHY, SMOOTH, RADIANT SKIN? JCMASTER shower sponge pouf are made of net material, it creates a thick rich lather ✓ Bath sponges size and hardness are suitable for children, which may be too hard for babies, but most customers can accept ✓ JCMASTER shower sponge pouf are made of net material, it creates a thick rich lather ✓ Gently clean and exfoliate your skin thoroughly, remove skin dead cells ✓ This net shower mesh pouf is soft enough to be used on sensitive skin ✓ Body bath scrubber are available with multiple colors ✓ The bath sponge a layer of lack mesh which make the mesh pouf looks much more elegant ✓ JCMASTER shower loofah sponge pouf equipped with elegant package, it is a perfect present to your family and friends at any time Fresh, exciting shower sponges. ★ Pure Color Mesh Bath Sponge: Enjoyable, relaxing, soothingly luxurious bubble baths, showers and bathing experiences – are now possible!Large size ensures higher area-coverage, yet lightweight at only 75 grams for maximum ease.Perfect for normal or sensitive skins. Great for daily body or skin exfoliating and cleansing routines for both men and women.Makes for a perfect baby shower, birthday, or any other form of personal gift for those you cherish! It is a perfect present to your family and friends at any time. Read more ★ How to use: Before use, soak it with hot water to clean and soften.Apply soap or body wash to a loofah. Scrub your body in a circular motion. Pay special attention to the body areas with rough skin like elbows, knees and feet. Repeat use can reduce dry skin or callouses, allowing softer, smoother skin. Use a soft towel instead of a loofah to clean tender areas.Rinse your body completely, and wipe dry. To prevent the growth of bacteria or mold, rinse the loofah, squeeze out extra water, hang it to dry. Read more ★JCMASTER exfoliating bath sponges remove dead skin, make skin smooth and promote blood circulation.